Add this arrangement to your cart if you’re looking to beautify your Valentine’s Day event or if you need a cheerful centerpiece for a dinner with friends. 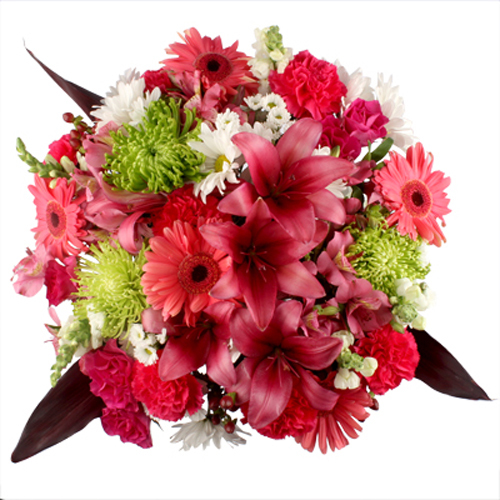 This arrangement has highlights of Carnations, Lilies, and Gerberas. FiftyFlowers ships this to you free, directly from our farms, right to your doorstep. Each flower bouquet contains 4 White Pompon Daisy, 2 Red Hypericum, 6 Fancy Dark Pink Carnation, 6 Select Dark Pink Alstroemeria, 3 Burgundy Green Cordyline, 3 Green Spider Mums, 5 White Snapdragon, 2 Dark Pink Lily Asiatic, 4 Micro White Pompon, 2 Pink Matsumoto, 3 Dark Pink Gerbera. Since flowers are a product of Mother Narure and due to variation in monitor resolutions, the exact colors of these flowers may vary to some degree.